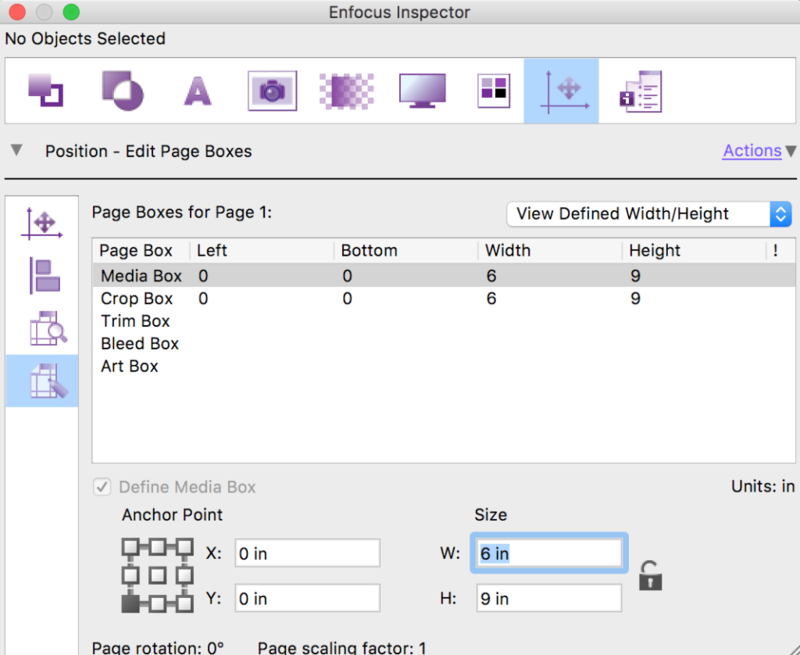 How do we resize PDF pages with PitStop Pro? 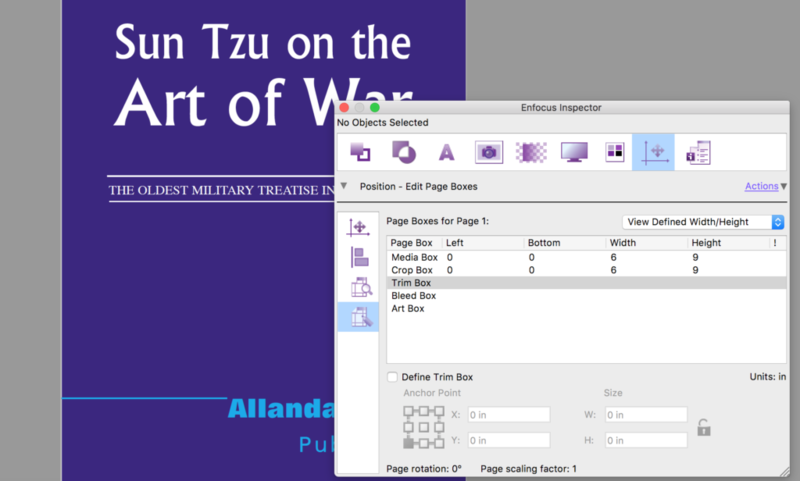 You can easily resize PDFs manually or automatically. Let’s take a look at both methods. 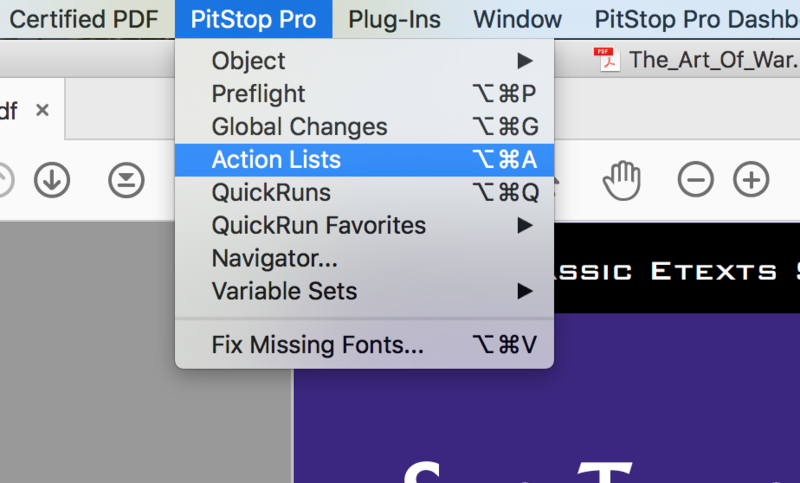 Go to the Position icon at the top of the horizontal icon list in the PitStop Pro Inspector. Then on the left side, choose Edit Page Boxes—it is the last icon in the vertical list. Once you are there, select the page box that you want to change and in the Size W and H fields you can fill out the new, desired value. You can do this proportionally or not. If you click the lock icon then it will be proportional. Tip: If you type 6 in + 0.25 in then PitStop will do the calculation for you! You can define all the boxes you want to change this way. Notice also the Anchor Point selector (bottom left). This allows you to choose your reference point for calculations. 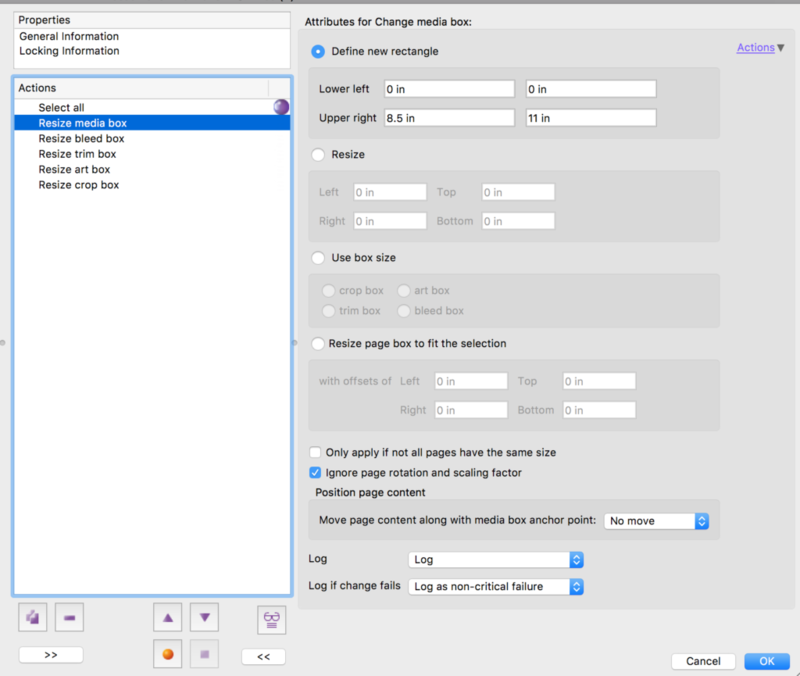 So, if for example, you choose the middle then the newly created page box will be centred. 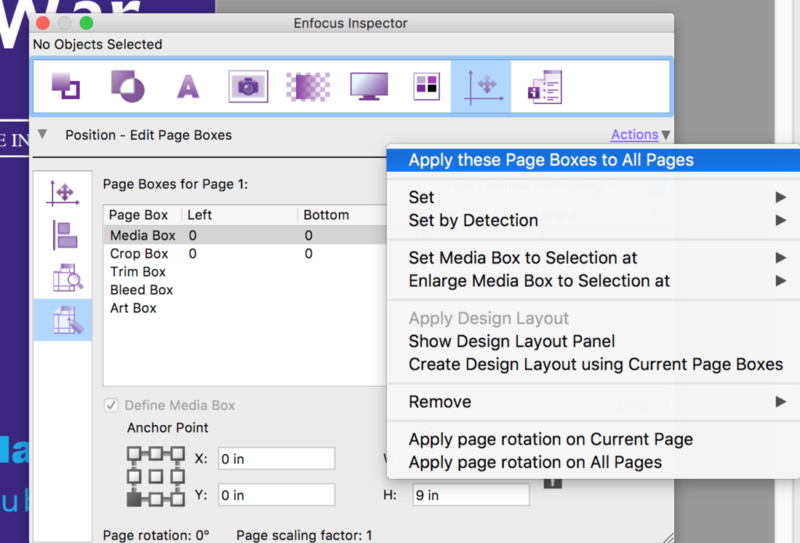 Tip: If you want to apply the specified page boxes to all of your pages then you can do that easily from within “Actions” in the Inspector panel (see below). If you want to fix many documents with a single click, then follow these steps to create an Action List that cn be run within PitStop Pro or fully automated with Enfocus PitStop Server. In the search field, left top, type “box” to filter all the box related Actions. You will see “Change [x] box” listed. Double click to get them into your Actions list or drag and drop them into the Actions list. 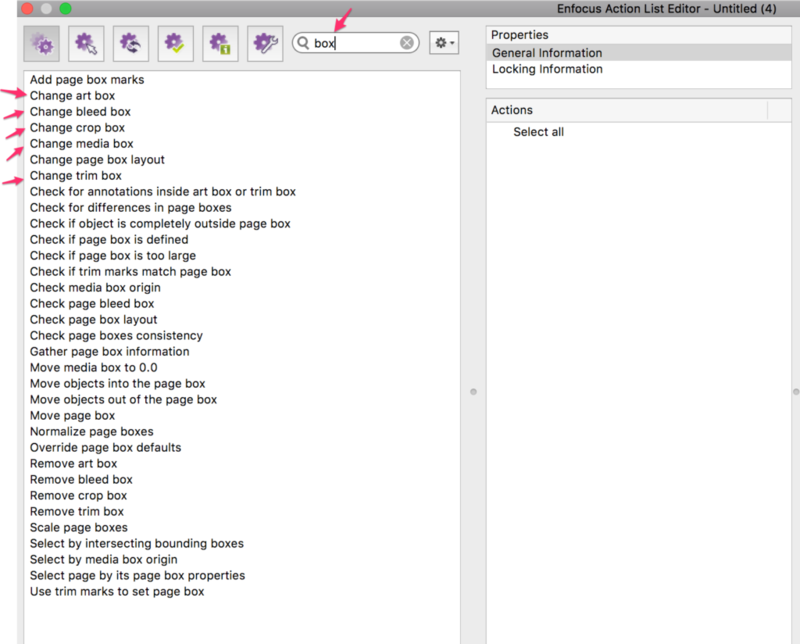 When you’ve chosen the Page Box Actions for the boxes you want to modify, you should see something like this. Depending on your requirements, you might want to add the actions in a specific order with specific settings. Once you’ve configured your steps, name your Action List and it is ready to be used. If you need to adjust any of the boxes to a value from XML or a database then you can use Enfocus PitStop Pro Variables instead of fixed values. 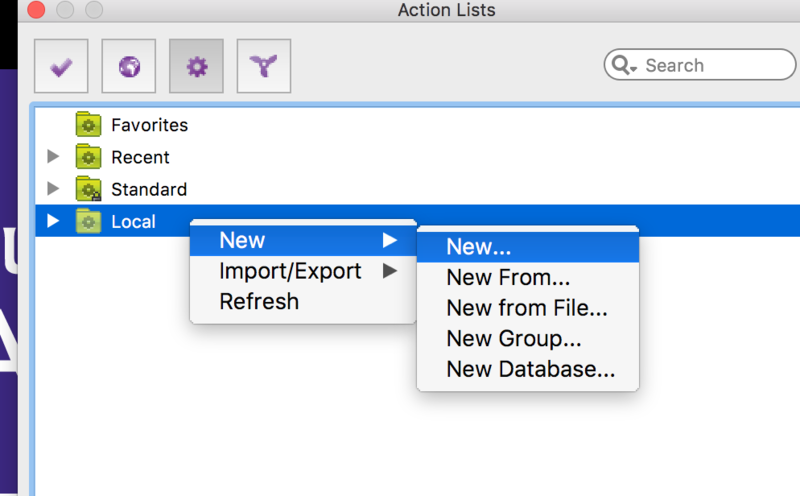 You could run this Action List in PitStop Pro (the Acrobat plugin version), batch process large numbers of files via PitStop Server’s hot folders, or even route jobs through a fully-blown automated workflow in Enfocus Switch. The Enfocus product range provides the tools to match any scale of print production needs. And there’s a great deal more to discover about Enfocus products, so if you’d like to learn more, please contact us today.